Mike M is melting in Arizona, and Mike S is melting in Vermont. It isn't pretty. They are also upset that (The Artist Formerly Known As) Prince didn't include them on the memo that stated "the Internet is over", but the Mikes aren't completely convinced, due to the work involved with the ever-increasing sales Mike S has to manage, and the increasing traffic and downloads Mike M has to monitor. 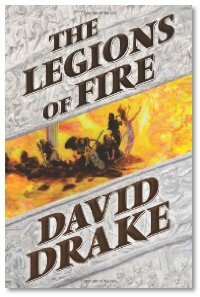 Interview: This week, Mike and Lorrie Mennenga chat with David Drake about his latest novel, The Legions of Fire. It's the first in "The Books of the Elements", a new four-part action fantasy series from Tor, set in fictional realm reminscent of ancient Rome, and Dave talks about how the story was influenced from his reading about the Sibylline Books and the Roman leaders who consulted them throughout history, and also talks about historical inaccuracies and assumptions based on stories where poetic licenses were taken, and more.